What if…you had access to a machine that allowed you to go backwards or forwards in time? The clock would instantly turn back to August 15, 1969 for me; the day that Sweetwater took center stage in Bethel, New York, kicking off the three-day event that will forever be remembered as the Woodstock Festival. Atop my flowing, bedraggled locks would sit Bop Basics’ Raffia Braid Sunhat, keeping my tresses under control as I tilt my face towards the sky, soaking up the sunlight and sounds of Janis Joplin with The Kozmic Blues Band. Gone would be the dark wash skinny jeans so commonplace in today’s society, instead my lower half would be accoutered in GOLDSIGN’s Desire Relaxed Flare Jeans as I sway my hips to the hypnotic rhythm of Santana. My Of Two Minds Gauze Long Sleeve Top would ethereally billow out around my petite frame as The Who launch into Tommy; while knotted around my wrist, visible as I toss my arms in the air to lose myself to the strains of Jimi Hendrix’s guitar, sits Shashi’s minute Petit Golden Nugget Adjustable Bracelet. As the stars twinkle in the inky midnight sky, fellow revelers lie back upon Navajo-printed blankets littering the well-trodden grass; bringing another day of music to a close, and dreaming of what the next will hold. Where would your time machine take you, my loves? Would you choose to relive history, or go back to the future to experience something brand new? Would you wear modern clothes, pieces from the past, or something never before seen? Don’t be shy, kitty cats…dish! Thanks to Iva Messy for the picture. I so love that top! woo..good questions on time travel. I can't think of anything in the 80's I'd want to wear. Maybe something classic like a Jackie O outfit from the 60's..but really the 70ish look is where its at..Woodstock! I watched Taking Woodstock not long ago and there was some pretty cool outfits to wear just to get in the mud. I've been reading TWELVE and Chace Crawford is White Mike in the movie and it takes place in the 90's so that might be interesting fashion wise, too. Oh love I'm quite sure I would probably go to late 60s Early 70s too! I would die from Excitement if I could have gotten to see Woodstock. I've always let I was born in the wrong time period anyway, it might be hard to convince me to leave behind the romantic style of that time because it is so dear to me. Great post and I LOVE that quote!!! ...it would be so great! That is a question that I have thought of before, haven't we all? Im like you though, I think of iconic music and events! I would love to have seen the Beatles when they first came to America! 1. Love those tights in the picture! You write so beautifully! But hmmm..I think I might go back to Egypt during Cleopatra's reign. Lots of gold, lots of eye makeup, and a side of scandal as well. Firstly, I love Jeremey Irons with a passion - where is that quote of his from. Secondly, I would go to Woostock as well, my dream. Le sigh. Time travel sounds so ideal. When I think about it I would love to go back and redo it all. But I really love where I'm at in life...if I went back things might change. Don't forget to enter my cumstom elastic waistband skirt giveaway! such a lovely look. so hip! I like that time machine. Just don't know where I'd want to go though. Oh my gosh, love that pic. I'd love to go to the 1920's. Just seems like a fun time to visit. I wish I had a time machine! I would travel in Ancient Rome wearing those wonderful maxi dresses! I love that bracelet! Ohhh, such a hard question. I think I'd want to try going back to the 50s to be a perfect Donna Reed-style mom... Although I'd probably only last an hour before realizing that washing windows is really not my thing! Great post idea darling! I love it! I would love to go back in time and see The Beatles in concert... or Woodstock, like you. Basically I'd love to live in the 60s! What a great post, Erika! I can imagine you at Woodstock, swaying in the breeze with all those free living flower children! My time machine would also take me back to the 60s, but to London. I'd stroll down Carnaby St in a Mary Quaint mini and false lashes, pop in Biba for a maxi dress and some gold bangles and spend the evening swinging to the sounds of the 60s! Oh it'd be so hard to choose.... Princess Diana's wedding, the coronation of any French king/queen, catching a glimpse of Elvis/Marilyn Monroe, being at JFK's funeral.... the list goes on! Great question... while there are so many moments in history I would love to witness, I think I'd go back to 2006 and make completely different life decisions - the internship, the boy, the city - I would have done it all differently. so dreamy. love those stockings too..in the top picture. I dunno. I wish I had Wyona Ryder's style from Heathers. What a fabulous 'what if"... I would love to travel forward in time. Sorry, I'm so proactive. Hahaha! I would love to know how it is to live 50years from now. What technology advances are there, what clothes are the people wearing. and the quote above is one of the best ive ever heard! I would go back to the fifties..the women were so feminine then, I love how they wore dresses all the time! I can totally imagine you at Woodstock! As for me, I wouldn't mind traveling back to Shanghai in the 30's. I would go to the future to experience something crazy and new! But as for styles of clothing, I do like the 50s glamour look! Oh my, I always want to time-travel to the past. I'm such a history nerd and love so many different eras, it would kill me to actually relive them. Woodstock is definately near the top for me too! Oh, I LOVE this! :) What a clever, thought-provoking post! Personally, I'd probably trail off to the future.. I'm undeniably nosy and would love to see where I am in ten years time! amazing post, Erika! 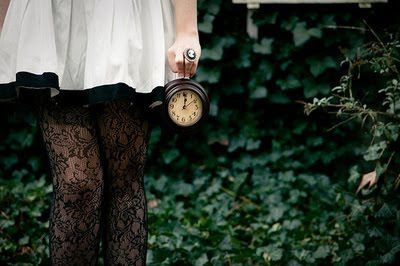 I love the lace tights in the photo...enough for a guy to stay in this time dimension. BUT, if I had to choose, I would love to see for myself what fashion was like during the Harlem Rennaisance period. hope you had an amazing weekend! Aw, I won this book filled with fashionable ads and such from the 60s and I could so picture you as a wild child looking so fashionable in your top and gorgeous sunhat! I would go ... hmms, maybe back to the 18th century where all the coffeehouses were made popular in Britain and pick apart a poet's mind while looking like an upper-class lady (this is all thanks to studying for my 18th Century British Lit exam tomorrow haha). I love the quote! I'm going to have to remember it. I'm not sure where I'd go back to. Maybe to see my great great grandparents and what they were like and how their lives were. That would be really cool! Would probably go back to my wedding day, remove the ghastly make-up and put some light one on. LOL. What an inspiring question... I so love it when you bounce these, which you so nicely and regularly do! I'd probably want to scoot back over to the eighties. I'd wish to feel the excitement of the developing music industry. Be in New York. Live what Madonna did in the movie 'Desperately Seeking Susan". Dress up in punk chic. Have drinks and get up on a sofa... somewhere, only to continue my adventure onto new disco floors. A gal can dream, huh. Even if it is a bit crazy... of a thought. For the past few days I've worn my bangs up like I used to do back in Jr. High. It feels so amazingly good to rediscover that look... sweet "Breakfast Club"-"Sixteen Candles" memories! Cult films for me. Thanks immensely my fashion cupcake cutie - now I can hop over to the Paris buzz with sweet memories warming my little heart! Every time I visit you, I am so amazing by your beautiful, witty, and inspiring writing my dear! You are truly talented. I love this post, and the imagination you stir up in all of us. I would love to travel to SO many different time periods. Since living in Rome I have always had visions of being able to step back just for a few hours, to see Rome during the crazy days of it's glory! LOVE this--I'm thinking corsets and petticoats!! Wow...Woodstock, that would be a great adventure! My time machine would take me back to the Tudor rein in 16th century England...I would love live the lifestyle of court but for a moment. LOVE this question! I want to go everywhere really — England in the early 1800's/1900's, the US in the 50's, ancient China...I'd also love to go a hundred years from now to see how everything has changed! Good thought provoking question. I think I'd go back to the late 70's. Love the quote. Mr Irons... So clever! Woodstock sounds great! I would love to have a peek into the Golden 20s, please! Oh! That would be an awesome time to go back to! I would love to have grown up in the 70's! The disco era with all it's glitz and glamour is calling my name! That gauze top is so fabulously beachy! I would love to go back to the time of full skirts and perpetual red manis! I'd go back and spend more time with my late dad. I miss him a lot. I love this post! Beautiful in every possible way! That sounds like an amazing place to travel to! I want to time travel badly, especially here! I think I would like to travel to the west and become a cowgirl and ride a horse! Yeeeehaww, lol.